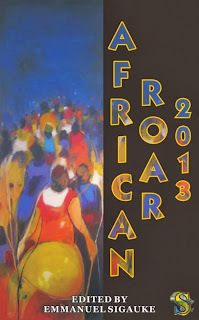 African Roar 2013 is the fourth Anthology from StoryTime, which was first published in 2010. 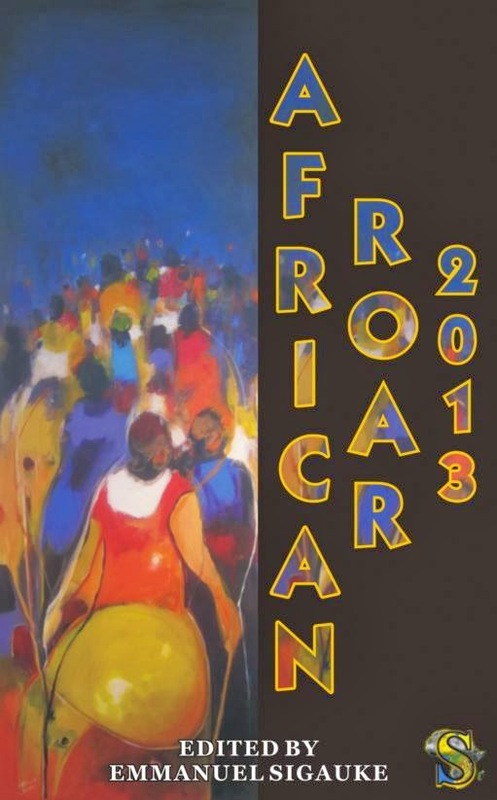 It has been described as 'a multi-genre annual anthology of African authors'. The fourth anthology is edited by Emmanuel Sigauke - the founding editor of Munyori Literary Journal. African Roar 2013 contains 13 beautiful short stories which took me on a journey I enjoyed so much that I devoured it in one sitting. It was also a nice treat at the end of each story to find out more about the authors behind them. While I was drawn to some stories more than other, I found that as a whole this was a strong collection with well-thought out and well-written pieces. I could go into each and every story, but then that would spoil it for anyone who wants to read it. Instead I'll say a little bit on a few of the stories in this anthology. But first, thank you to Ivor Hartmann for the review copy. My favourite would have to be Home by Alison Erlwanger, especially becasue of its theme of African identity and figuring out where your home is. I really enjoyed this and found this to be a great opener which set the tone for the rest of the Anthology. Fungisai (a coloured woman from Zimbabwe) and Neville (her Nigerian boyfriend) both live in America. I say coloured not to be offensive but becasue Fungisai called herself coloured as 'mixed felt like a borrowed term to conform ro American interpretations of such a fluid identity' (p.6). Reading it made me think about what it means to be African. Fungisai with her thick lush locks and 'coloured' identity was not 'African' enough in some circles, like Neville's Nigerian academic elite friends. Which begs the question, what is African enough? What does an African look like? And are you less African if only half of you is African? I also loved the way there was a seamless transition between the three characters in the story. When it first begun I thought it would be all about Fungisai, but then part way we move to Neville's perspective and then as the story goes on we get introduced to a third character - Neville's ex-girlfriend (and first love) whose memory he can't shake. So while Fungisai is focused on her hair and identity, Neville is caught up with seeing his first love for the first time in year. And his ex? She's interested in 'fine wine and beautiful jewellery' (p.22). A lot can happen in one night, as shown in this story, but it does end with Fungisai claiming 'Africa is an ideology' for both her and Neville as they both have not been there for ten years but still having it 'in our minds, in our arguments, in our dissapointments' (p.24). Speaking of transitions, Transitions by Barbara Mhangami-Ruwende was another story I enjoyed. In Transitions, we see the changes in Portia's life from 1979 when she was seven and her family moved from Luveve - a black neighbourhood with 'radios blasting the music of the Soul Brothers, children playing on the streets, and vendor hawking Ice Mints, Bazooka bubble gums, and matches' (p.83) - to Killarney - a quiet, all-white suburb. Portia did make a friend - with Theo - the kid next door, but they could only play when his parents were not around. To understand this you need to be aware that Portia's family were the only black family in this all-white neighbourhood - the only other black people were maids, gardeners or cooks. Moving to this new neighbourhood also changed Portia's family, as they never quite fit in. Her mother did not want clothes dried on the bougaineillea bush infront of the kitchen, 'Do you want these people to think we are filthy pigs?' (p.87), her parents argued for the frirst time and their mother constantly fussed over their state of cleanliness. As time goes on the neighbourhood changes and we read how this quiet, sleepy suburb transitions into a busy bustling place. Another story with the theme of race was Green Eyes and an Old Photo by Ola Nubi - although this was about a man looking back on his time in England when he was younger. Here is where he met his first wife, and possibly his real love, on a cold day when he was being harrassed by four or five men who threw racial slurs and asked 'blackie to clear off and go back to your country where you live in trees?' (p.160). It is interesting how something so negative (racism) can somehow lead to something so positive (true love). Sandra (who eventually became his wife) might have assumed Nigeria was closer to Jamaica, asked if he lived with lions and tigers and was very impressed that he talked posh, but despite her ignorance they were both curious about each other. Plus, they both loved the Beatles. They did experience more racism - occassional looks and dissapprovign glances from outsiders, and it did not help that her family also did not approve of the relationship. All this we learn (and more) as he looks back on this time in his life while staring at the green eyes in the old photo. The Faces of Fate by Abdulghani Sheikh Hassan was an interesting tale which made me wonder if I am where I thought I would be as a child (not, really). The story starts with the female narrator who shares a desk with 'the two most jovial girls in the class, Njeri and Atieno' (p. 55). Atieno and the female narrator both wanted to be accountants and Njeri a pilot. As the story unfolds we see the path her life goes down, which is nowhere close to what she envisioned as she sat in class with Njeri and Atieno. As her life unfolds she would imagine that Atieno was pursuing an accounting course in Kenya's finest college. I found this aspect interesting because of the fact that sometimes if we are not where we thought we would be as children we end up assuming that everyone else is doing better than you and living up to their childhood dreams and expectations. Yet a chance encounter with Atieno and Njeri, and them sharing their experiences, makes our female narrator realise just how different all their paths became. I really enjoyed reading this anthology and I found it refreshing. I will hold my hand up and say I haven't had the chance to read the first three African Roar Anthologies - and I should probably do so - especially as I am such an admirer of Ivor Hartmann, StoryTime and the work he does regarding original short story fiction from both new and established writers. Thank you also to Emmanuel Sigauke for editing this beautiful volume. I didn't get the chance to read his introduction to the anthology, but it would have been great to know his perspective and thoughts on the stories and the threads he saw weaving through the anthology. All that's left is to say is grab a copy. The e-book, if I'm not mistaken, is out now.